I just discovered an amazing little gem in my neighborhood– a seafood market. I’ve been searching for one since I moved to DC two years ago and I finally found it. I’m very particular about purchasing things from the sea… I rarely stray from Whole Foods and the only frozen seafood I will buy is shrimp. It was my friend’s birthday and I was set on making him Mahi. Believe it or not, Mahi is impossible to find up North and when you do it’s usually overpriced and not very fresh. Old Mahi is not ok, especially for someone like me who grew up in Florida. I talked to the owner of the market and explained to him what I wanted to prepare that night. This man looked like and knew as much about seafood as Captain Gordon himself. He said the best thing in his case that day was Grouper. Sold. I coated the filets in blackening seasoning and pan-seared in a bit of olive oil on high heat. 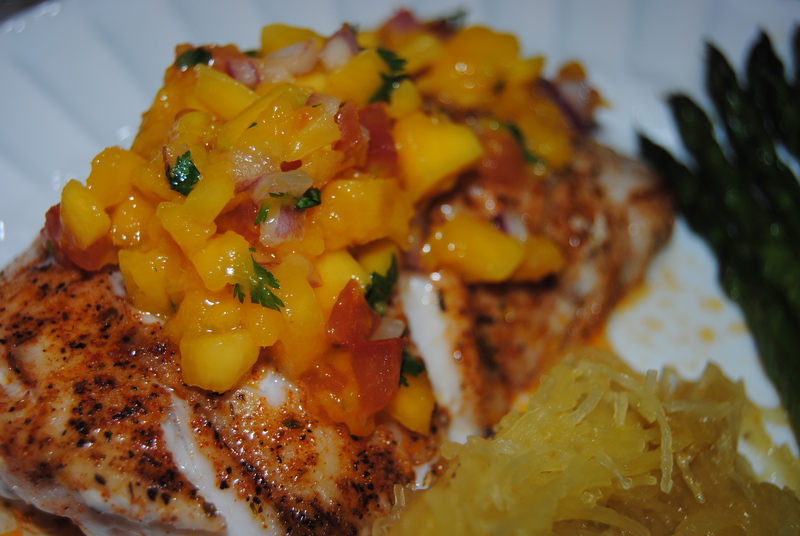 I made a fresh, simple mango salsa for the topping and served with a side of asparagus and honey- ginger spaghetti squash (recipe below). The result was perfection and I was very proud of myself. Then, out of nowhere, the meal was ruined by an embarrassing mishap. Mid-sentence, mid-meal I heard wood start to crackle. My chair teetered from left to right then literally snapped under me, sending me straight to the ground. I think I said something like “Wh—Wh—Whoooaa” before I plunged. Luckily I didn’t get hurt…the only thing I lost was my dignity. Let’s just say it was an unforgettable meal. Oh, and don’t buy furniture on Craigslist. Rinse fish and pat dry with paper towels. Put seasoning on plate and dredge both sides of fish (lightly) in seasoning, shake off excess. Bring skillet to medium-high heat and once hot, add fish. Let it cook 4 minutes, and shake the pan back and forth a few times so the fish doesn’t stick. Flip the fish, cover and cook another 5 minutes on medium-high heat. While fish is cooking, make the salsa. Chop mango, red onion, cilantro, tomato and lime juice and combine. I microwave mine for about 30 seconds. Serve on top of cooked fish. Preheat oven to 400 degrees. Poke holes in spaghetti squash with a knife. Cook in microwave-safe dish in microwave for 10 minutes. Remove squash (be careful- it’s hot!) and cut in half. Bake in oven on roasting pan with tin foil, cut side down, for 10 minutes. Remove squash from oven and carefully remove all seeds. Using a fork, remove all the “pulp” from the squash and place in bowl. It will look like angel hair pasta. Mix in 2 tbs of butter and set aside. Do this while the squash is cooking. Saute 1 tbs butter and fresh ginger for 1 minute. Add chicken boullion cube and saute another minute. Add honey and brown sugar and cook on medium for 2 minutes. Mix cornstarch and water until dissolved and add to honey/ ginger mixture. Let it cook 5 minutes, while gently stirring and on medium heat.Once the sauce is done, pour desired amount over cooked spaghetti squash. Come cook me some of that NOW!